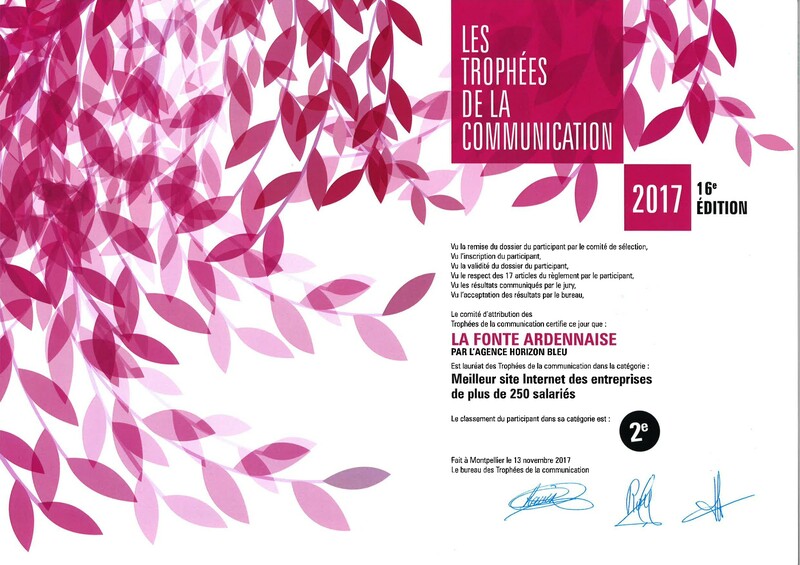 A Communication trophy award for LA FONTE ARDENNAISE ! The Communication Award ceremony took place on friday 24th of november 2017 at the PULLMAN MANDELIEU ROYAL CASINO in Cannes ,France. This event was the opportunity for LA FONTE ARDENNAISE to be awarded with a second place in the category "Best web site for compagnies over 250 employees" for thanks to the work with its partner HORIZON BLEU.
" It was necessary for LA FONTE ARDENNAISE to have a vibrant and innovative new web site in line with the ambitions of our group : To be the first european independent subcontracting foundry ! HORIZON BLEU was able to implement the right digital positioning , a new and intuitive ergonomy , a unique domain name for all affiliates and also an international referencing" says Nicolas GROSDIDIER , president of the LFA board.